From left to right: Original casted well weighing over 40 pounds. The same well after about 10 years of elements and lawn mower hits. The newest well on right taking 3 days to make and only 5 pounds. Images courtesy of Debbie Morrow, All Rights Reserved. Many times I can work better under pressure. This is one of them. When my Ring Girl Well was destroyed between lawn mower hits and age, I was at a loss for a few days. Since I’m still recovering from back surgery I couldn’t think of any possible way to achieve the rock casting and the bending needed to either repair or make another well as in my older Ring girl well tutorial. Since I am always looking at other people’s DIY ideas, I recalled someone making a well out of Styrofoam years ago. It was from The Haunter’s Hangout. Still – their directions looked more than my back could handle. I also ran across a more likely tutorial to complete at Halloween Forum by -ND4SPD- Zombie in a link thread on a mechanical Samara. Both tutorials were great on their own. Yet, since I was physically challenged I knew the only way I was going to make another well was: 1) Materials had to be super light for my back. 2) It had to be made quickly, since all props go out this week . 3) The project could have only a minimal amount of cutting/physical effort – no bending. 4) It could not empty my pocketbook. 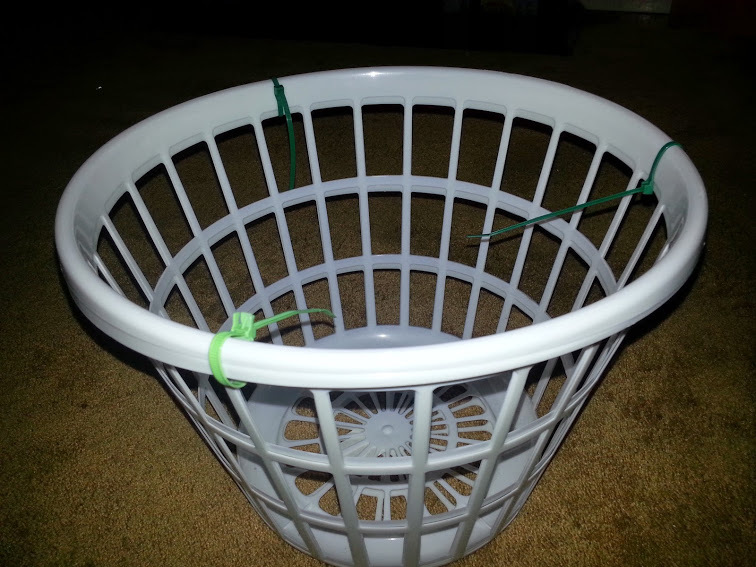 First I took the two Dollar Store laundry baskets and used the zip ties to secure them together to make one strong basket. I then took Styrofoam from previous projects and from product packaging and began to cut 5 sections that were a little taller than the basket (see images below). I secured those bricks by making a hole with a wooden skewer and then slipping a zip tie through,securing them to the basket. I then flipped the basket over and cut out pieces of foam for each brick and glued those pieces to eliminate the space that occurred at the bottom of the basket (most circular laundry baskets taper smaller toward bottom). I then took contact paper pictured in third image and wrapped it along the inside of the basket.This will allow the spray foam to only go where I want it and not into the basket itself. The last image in this group shows all the pieces of foam attached to the basket. Notice there are cut marks in some of the foam to make it appear like they have breaks where mortar is. This cut is achieved by cutting an acute angle piece out at the top of where I want the “mortar” to appear and another acute angle upward toward the first cut. Foam aligned to well with some of the supplies. Foam pieces glued to bottom to fill in taper gap. Contact paper and foam used in project. Contact paper wrapped around inside basket. All foam bricks attached, contact paper in place, and ready to foam. After I prepared a table surface with cardboard (because that foam is tough to remove on anything), I flipped the well upside down to spray the expanding foam. But before I actually began to spray – I grabbed any loose pieces of foam I had left from my cuttings to toss into any crevices of the space between the basket and the foam. This way, less spray foam is needed. Foam first sprayed from basket turned upside down. Once bottom foam fill is dry, flip and spray foam on top and crevices. Let the Fun Begin – The Painting! It took light grey, dark grey and black acrylic paint to make the foam look like stones. I used a plastic bag to dab on or take off any access because using a bag makes a texture with paint. Add a light base (mine was grey) to all the stones. Do not cover the entire bricks if using green foam. Leaving the edges untouched and dark will help with the effects later. Darker grey was randomly added on top of the light grey but was concentrated more toward the edges than the middle. Think how mold occurs on aged stone: Black paint was again randomized but concentrated toward the edges where mortar and sides of stone are. Use a low temp. 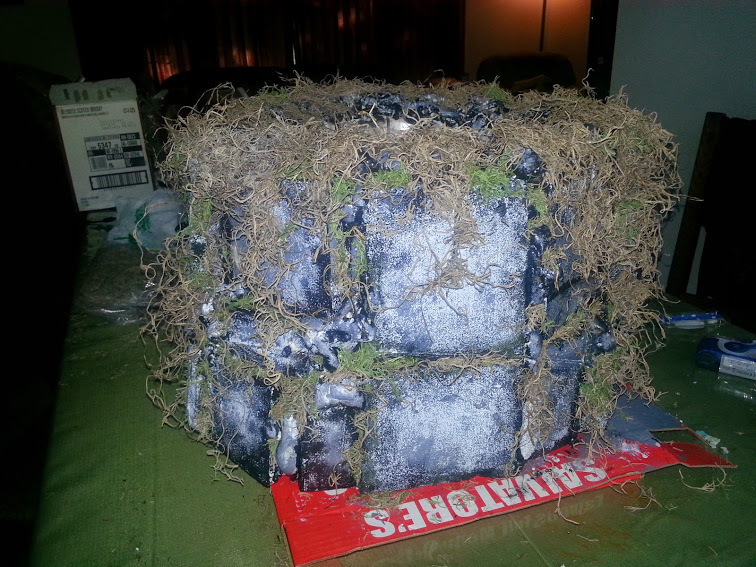 glue gun to attach moss into crevices and on top of well. Use it to cover any zip ties and trail along mortar seams and edges. I couldn’t decide whether to add brown or green but both of those types of moss have merit. The brown is stringy and allows for more coverage and the green adds a more realistic forest touch. So I used both. If you have any further questions on this project, please feel free to contact my email or leave a comment. Thanks! This entry was posted in Uncategorized and tagged Halloween, Inexpensive, Movie Prop, Prop, Quick and Easy, Samara, The Ring Girl, The Well by thewritegirlforthejob. Bookmark the permalink. Do you leave the zip ties in place or remove them? I do leave them in place. I just trim them enough to not be seen or if they are visible, I would use a little moss and a little hot glue to cover. After the well was out in rain and elements for 2 months, everything was still intact and did not need a fix for this year. 🙂 As always, please share your haunt pics! I love to see what others do. Thanks for your interest!